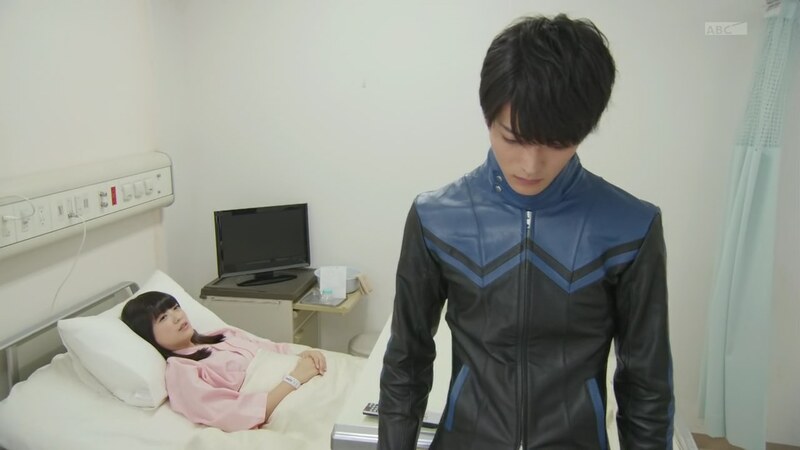 Recap: Kamen Rider Ghost, Episode 14 – Spectacular! The Dawn of the Earth! 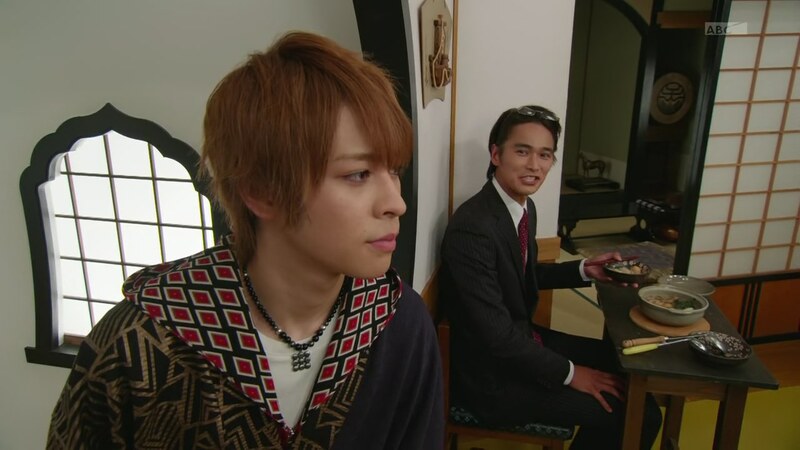 While Ryoma enjoys modern foods, Akari shows everyone how much the Ganma network interference has grown since yesterday. Takeru wants to rush out, but Onari says to leave this to them. Akari reminds him that he has to focus on the Satcho Alliance. 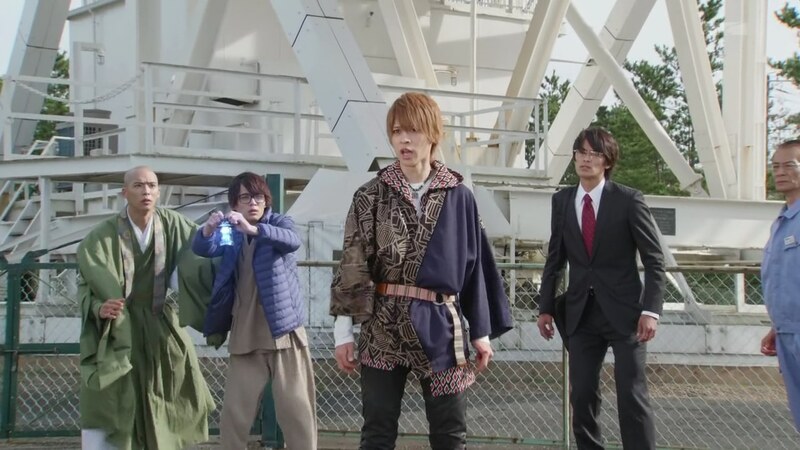 Takeru doesn’t think some family feud is more important than saving everyone in the Tokyo metro region, but his friends assure him that they’ve got this. Ryoma is amused by Takeru’s reliable friends. 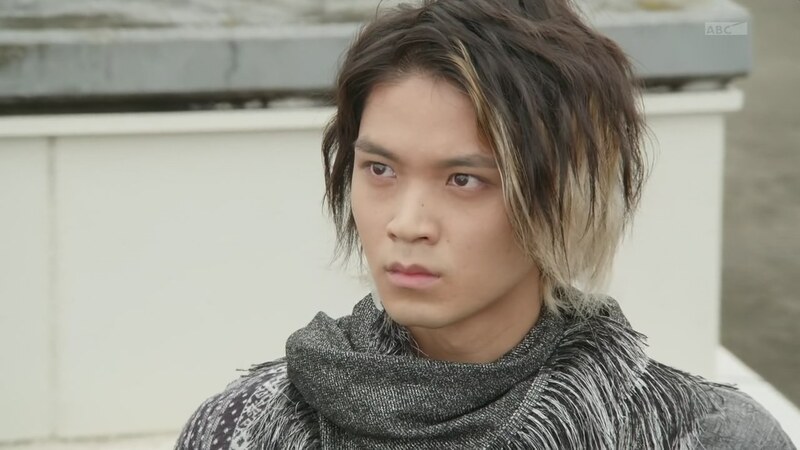 Takeru heads out as Ryoma lets Nagamasa comes back to the forefront. On the way, Takeru asks Nagamasa about what he meant about something happening in the past. Nagamasa explains that it was the dream of his, his father and his brother to work together to advance space development. His father taught them about coming together to make anything possible. But Satsunoshin gave up on space development when Nagamasa’s brother Yoshiyuki got hit by a car and died after they had an argument. Since then, Nagamasa has wanted to continue their dream of building a satellite with their father. “So, are you giving up on your dream then?” Takeru asks. At the lab, Akari shows Onari a location they can check out so Onari takes Shibuya with him while he tells Narita to stay and help Akari. Akari calls Makoto at the hospital. He later goes to Kanon who knows he is worried about Takeru and the others. She tells him she’s fine and that he can go help. Makoto thanks her. Takeru and Nagamasa arrive at the plant. Takeru says he’ll go talk to Satsunoshin first. He walks through walls to get into Satsunoshin’s space-filled office. Satsunoshin looks at the photo of him with his two sons and says this was the happiest time of his life. He is telling Yoshiyuki that Nagamasa has been working hard to achieve their dream. Takeru makes himself visible and tells Satsunoshin about Nagamasa’s dream of working together and that he should help. Satsunoshin says it would be too painful to remember his son. Takeru tries to remind him about the romantic adventure that got them interested in space. 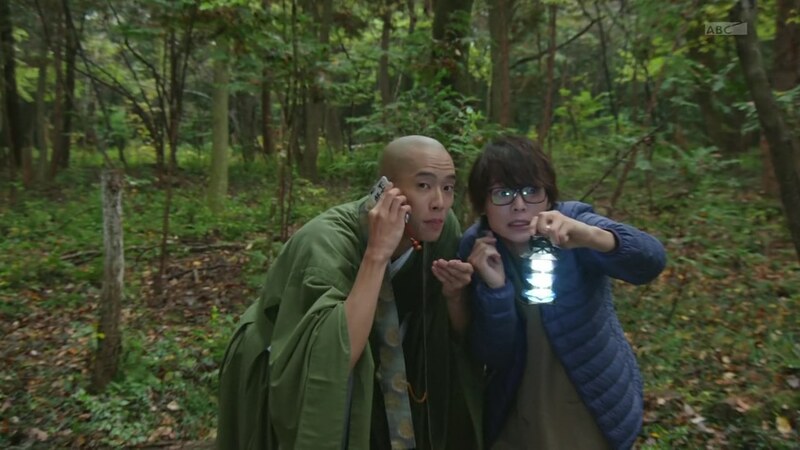 Onari and Shibuya are searching through the forest until Shibuya uses Spider Lantern to reveal Ganma lurking around. Takeru rejoins Nagamasa outside the plant and vows not to stop until he’s reconnected Nagamasa and his father. Nagamasa says not to bother any more. Before Takeru can ask Ryoma to clarify, Shibuya calls to tell him he and Onari are in big trouble. 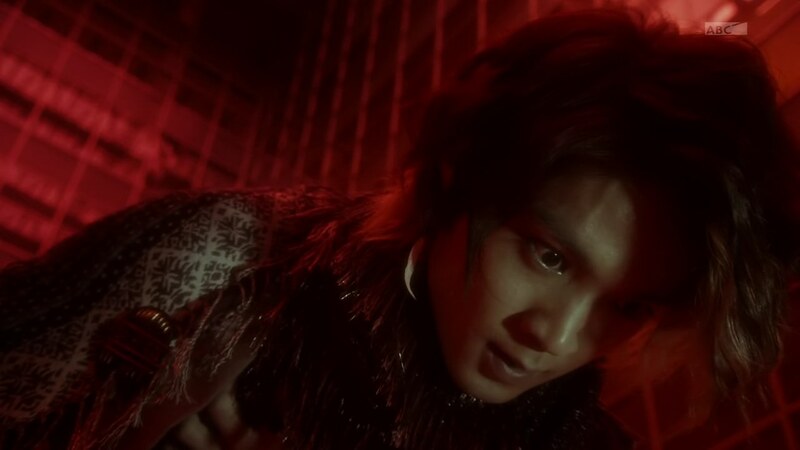 Takeru is ready to rush off, but Ryoma cautions him that panic can lead to mistakes. Makoto arrives to save Onari and Shibuya. He calls Takeru to tell him he’ll handle this while Takeru does what he needs to do. “It’s good to have friends, isn’t it?” Ryoma says. Takeru knows what he needs to do. Ryoma sinks back in as Takeru pulls Nagamasa into the plant to face Satsunoshin. Takeru gives a heartfelt speech about fulfilling their dreams and carrying on the wishes of the dead. Father and son finally have a heart to heart. Satsunoshin feels guilty about his son’s death, but Nagamasa says there’s nothing to be sorry for. Yoshiyuki would be happy if they worked together again. The father and son shake hands. Akari finds a satellite where the radio interference waves are originating. This is where Aran is. Alan flashes back to meeting his brother. He asks why he was not told about the true power of the luminary Eyecons. Big Brother doesn’t think the power to obtain a physical body is all that important other than to be used as a weapon. The Ganma world does not require humans. That’s why Jaberue was sent without Aran’s knowledge. “Yes brother.” Alan bows, but has an annoyed expression on his face. Back in the present, the soul sucking Ganma says they are ready to begin. The Ganma uses the satellite to expand the reach of the soul sucking. Nagamasa is informed that the satellite being used is one Satsunoshin actually developed. Makoto, Onari and Shibuya arrive at the satellite. 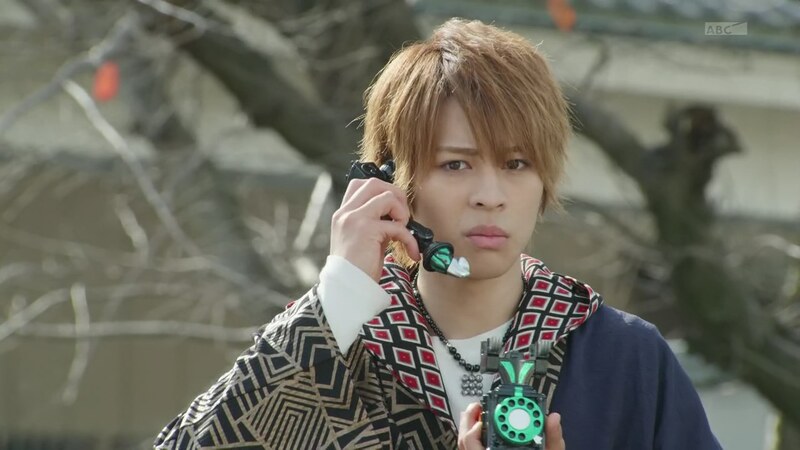 As Akari talks to Takeru on the phone to tell him, she gets zapped, just like all the others affected by the soul sucking interference. Narita picks up the phone and gets zapped too. Takeru sees a plant worker collapses as well. He goes to check on him and manages to grab the man’s soul before it flies away. 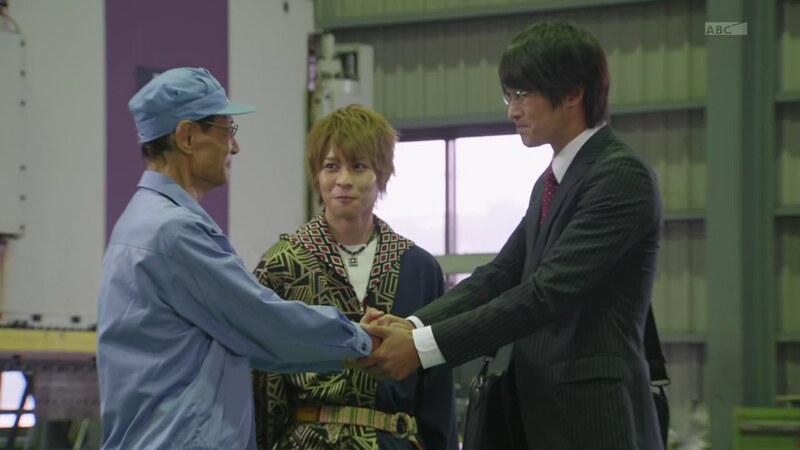 Takeru sees the man’s happy memories of his family. He lets the soul go and promises to save him. Yurusen confirms the Ganma are collecting souls. Takeru lets the father and son know he’s leaving, but they want to come and help. They arrive at the satellite. Shibuya makes the Ganma visible as Takeru is incensed that another Ganma blatantly disregards human life. Takeru says he doesn’t know what his dream is, but that he wants to protect everyone else’s lives and dreams. 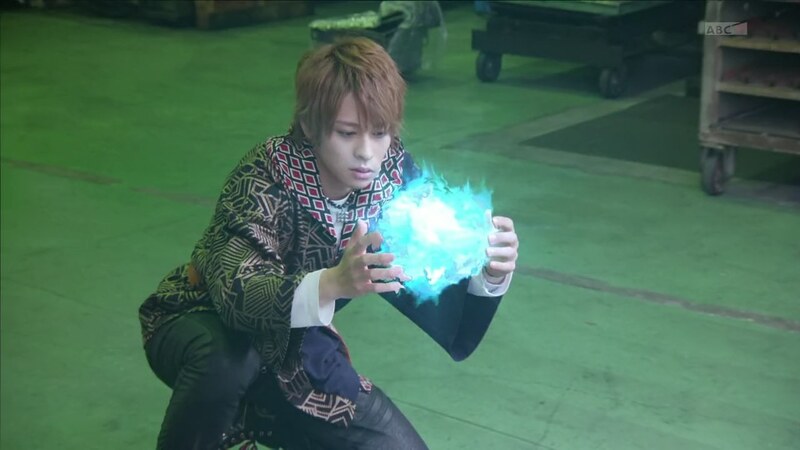 An Eyecon glows in Takeru’s cloak. 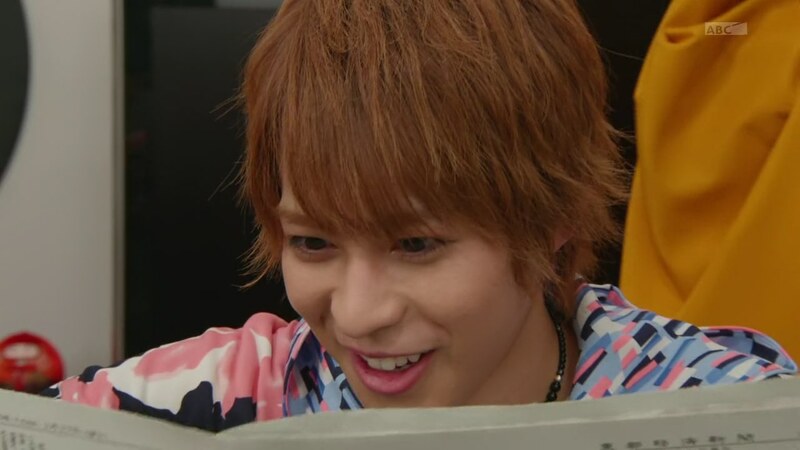 Ryoma pops up again, excited by Takeru’s dream. He says just like his comrades carried on his dream to create today’s Japan, how about Takeru unite the hopes and dreams of everyone. 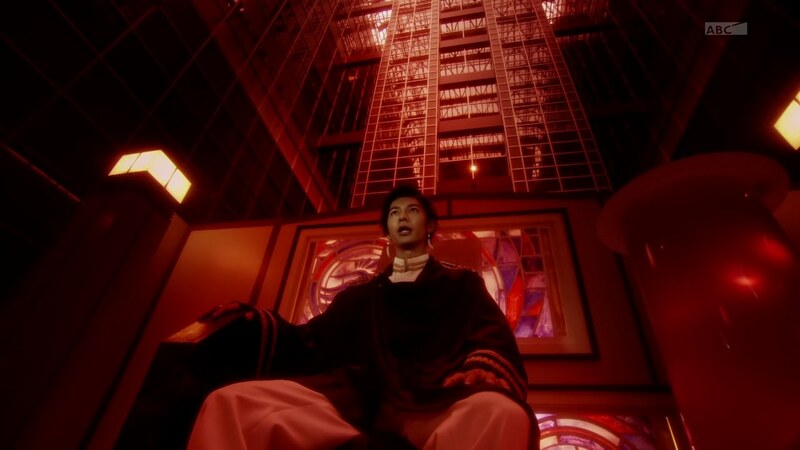 Ryoma gives Takeru his soul as he flies into the Eyecon. Onari and Shibuya accompany father and son to retake control of the satellite. But Alan decides to join in and fights Makoto himself. Aran says he is very disappointed in him. 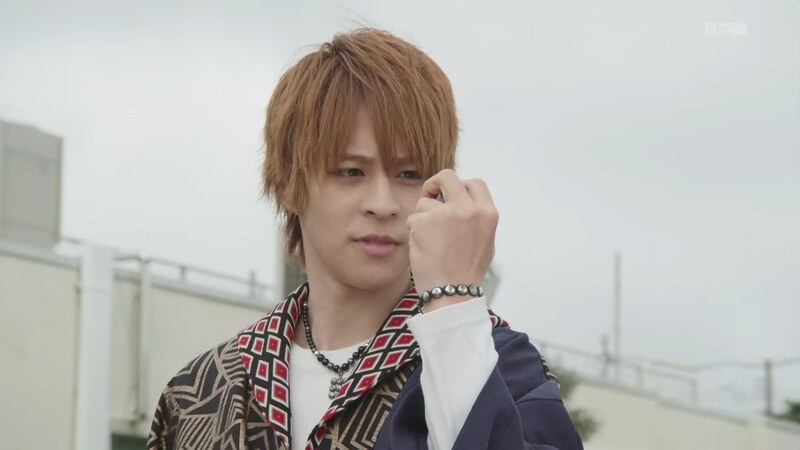 Makoto tries one Eyecon, but it doesn’t work. He goes Nobunaga instead. Aran tells the soul sucker to take care of these two so they can go kill the four inside. But Takeru won’t let that happen. Already in Boost, Takeru uses the Ryoma Eyecon and uphenshins. The Ganma tells Alan he’ll fly up to retake the satellite once again. Yurusen helps Takeru by calling Captain Ghost to take him up into space. Takeru is excited about space and even more excited to take care of the Ganma using his sunglasses. With that, the souls are returned to the people of Japan. Back at the temple, the gang celebrates their great teamwork. A good solid episode all around. The best part was seeing more of the Ganma world and finally getting a glimpse into AranAlan’s character and maybe the dynamics of his family or whatever’s going on there. It was awesome to see AranAlan fighting. Just knocking Makoto around with the palm of his hand. Very fun and I hope we see more. Definitely great seeing more sidekick shenanigans, but with them mixing it up this week. Nice fresh dynamics having Onari with Shibuya and Akari with Narita instead. 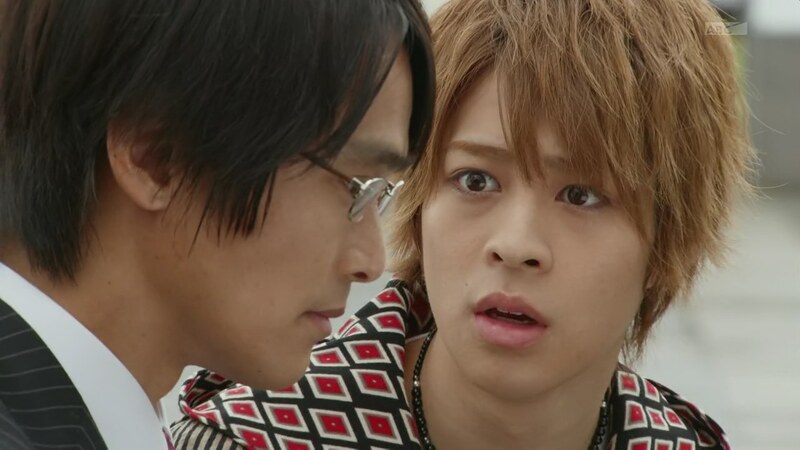 Takeru seeing into people’s souls was very interesting. Story wise, Ryoma knowing Ryuu and in a seemingly friendly way is interesting. Grampa Sennin though isn’t too happy seeing the Ganma taking big steps in whatever they’re planning. I wonder how long Makoto goes around feeling guilty. He definitely wants to be with his friends and help ’em out. Kanon will probably be the one to snap him out of it though. It’ll be one “Oniichan” too much and Makoto will finally deal with his issue(s). Hehe. So right now, we’re clear on what Takeru has to do. But everything else is still a big mystery. That’s a very intriguing place to be at this point. 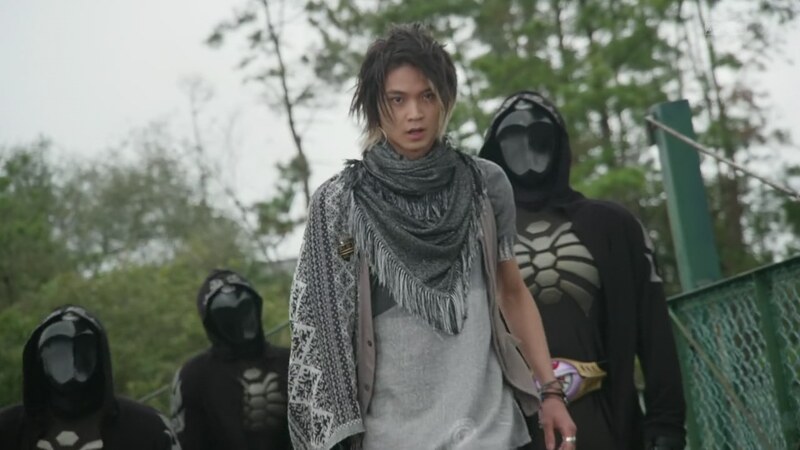 ← Recap: Kamen Rider Ghost, Episode 13 – Exciting! A Free Man!